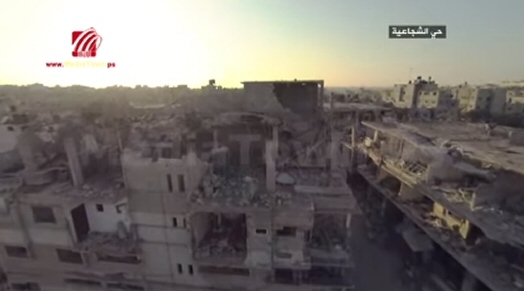 The scale of the devastation caused by Israeli shelling on Gaza during the recent two-month assault has been shown in an online video, Al Ray Palestinian Media Agency reports.The brief footage, archived by Palestinian-based production company Media Town, was taken above Gaza City’s eastern suburb of Al-Shuja’eyya. At least 2,140 Palestinians have been killed and more than 10,000 others injured in more than a month of devastating Israeli attacks on the besieged Gaza Strip since July 7, according to Al Ray. Furthermore, Israel demolished many archaeological and historical sites — some dating over a thousand years — during its assault on the region. Israel launched many attacks on “historical sites and monuments in addition to the rest of Palestinian infrastructure,” Hussam Abu El-Naser, from Beit al-Maqdis Institute, told Press TV. He also noted that many mosques were destroyed or heavily damaged in the Israeli onslaught. Since 2007, the Gaza Strip – home to some 1.8 million Palestinians – has reeled under a crippling Israeli blockade that has badly affected the local economy and played havoc with residents’ livelihoods, causing a decline in the standards of living, unprecedented levels of unemployment and unrelenting poverty. Shelter Cluster, an international organization specializing in post-war reconstruction assessment, says that it will take 20 years for the Gaza Strip to be rebuilt.